I am pro-gun. I don’t feel a need to qualify this statement, as many often do. I don’t see this as a partisan issue, but the parties would like to keep dividing us using issues like this. A hero of the Democratic Party, John F. Kennedy, was pro-gun. In fact, he was a lifetime member of the National Rifle Association, and he frequently spoke about the need of an armed citizenry as insurance against tyranny. 1) To date, every mass shooter who legally possessed the firearms they used, as far as I’m aware, either passed a comprehensive background check, or would have passed it had it been administered (there might be one or two exceptions to this from many, many years ago, but I don’t think there are). The Virginia Tech shooter passed two background checks. The Pulse Nightclub shooter in Orlando not only passed background checks, his was even more thorough than normal because he was licensed to carry a firearm as an armed security guard. The Washington Post, which is biased in favor of gun control, detailed every single mass shooting since 2012 and found that not a single one of those tragedies could have been prevented by any proposed gun-control legislation. Also, the rate of gun ownership in rural parts of the country is much higher than it is in the suburbs or in the cities, with 46% of people in rural areas owning guns as compared to 28% of people in the suburbs and only 19% in urban areas. However, in 2014, 54% of counties in the country had absolutely zero murders, while only 2% of the counties accounted for 51% of the murders during that year. If you look at the map from the link at left, and if you’re any good at knowing your US geography, you’ll quickly notice that the places with the murders are predominantly urban areas; Los Angeles area, Las Vegas, Phoenix, Seattle, Dallas, Houston, Chicago, Atlanta, Miami, New York, etc. In other words, the areas with the lowest rate of gun ownership have the highest murder rates. 3) Depending on the study, there are anywhere from 300 million to over 600 million guns in this country today, owned by at least 100 million people, along with trillions of rounds of ammunition. (For a detailed breakdown of how the estimated number of guns can vary so widely, it’s explained very well here.) Any way you cut it, that’s a massive number of guns, and gun owners. The reason I say “at least” 100 million gun owners is because gun owners have proven to be less than forthcoming to pollsters about whether or not they own a firearm, or how many they might have. In fact, the media’s bias against guns is evident in how they conduct and report on their polls, which is detailed very well here. Part of the reason for this disparity in the number of guns owned is that the bulk of our country’s firearms are completely and totally unregistered, which means the government has little idea what exactly they are, and no idea where they are. But the point I’m making here is that, with numbers that high, any attempts at banning guns outright and having them somehow removed from society would be impossible. Pandora’s Box is open, and it’s too late now, which means there will always be guns out there that mentally ill people, or gang members, will be able to find and use. All of these deaths are tragic. All of them. But it's important to know the ratio here. Not only are waiting periods not effective at curbing gun crime, they can actually be deadly, such as in the case of Carol Bowne. She was a New Jersey woman who went through the proper channels to legally purchase a handgun on April 21, 2015, because she feared that her ex-boyfriend, Michael Eitel, might harm her. She even called to inquire about the status of her gun permit on June 1st of that year, as it hadn’t yet been approved. Eitel stabbed her to death on June 3rd, in her driveway, six weeks after she applied for her gun permit. Any time laws prevent anyone from being able to defend themselves against those who would want to harm them, such as in the case of Ms. Bowne, I believe the government is complicit in the crime. 5) The widely circulated study that is often touted as proving that “if you have a gun in your house you’re more likely to be killed by a gun” is only true because it includes suicide. Suicide is always tragic, and we should do whatever we can to help prevent it. However, including a self-inflicted injury in a study about the danger of guns themselves is intellectually dishonest. And morally speaking, asking to restrain a person’s right to self-defense in order to prevent potential murders is much different from asking to restrain a person’s right to self-defense in order to prevent people from willingly killing themselves. Regardless, approximately 2/3 of all gun deaths are suicides, and that number is increasing while gun homicides are not. In fact, since 1993, gun homicides have dropped by half while gun ownership has skyrocketed. 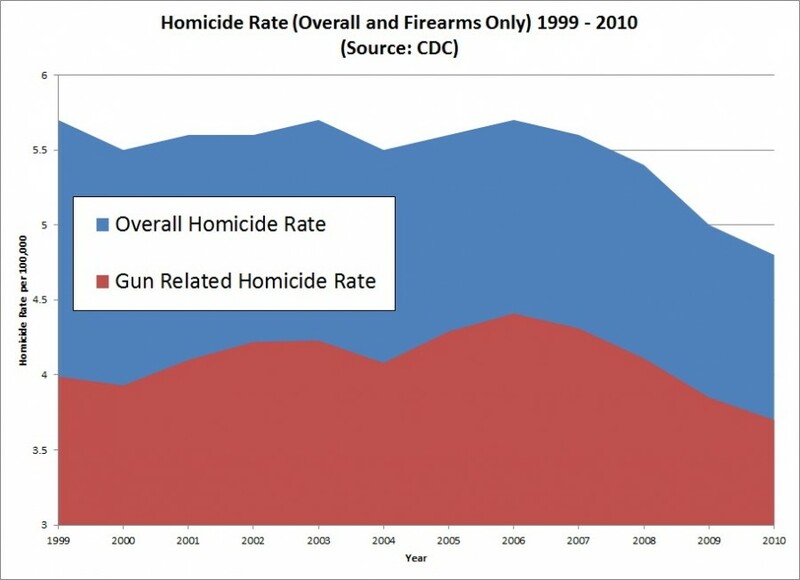 As you can see, gun homicides have the exact same cause as any other method of homicide. That's why the graph looks so similar for each. The answer is to go after homicides in general, and to do that, we need to address our many socioeconomic issues in this country. Gun bans and restrictions won't help this problem. For the purpose of this thought-experiment, imagine that no gun owner ever kills more than one person with their gun (meaning they either kill one person in a homicide or they kill themselves). Do you know how long it would take for the 30,000 deaths per year to reach just 1% of all gun owners in the country? It would take 33 years and 4 months for those 30,000 deaths per year to account for 1% of all gun owners. If the guns were the actual source of gun violence, with upward of 300 million guns owned by 100 million people, in a country with about 330 million people in total, we’d all be shot by now. The fact is, guns are a tool. They do not cause violence any more than a hammer causes a wall to be built. And I’m not done yet, because it’s one thing to say that guns don’t cause gun violence, but unlike most pro-gun people, I believe I actually know what does cause gun violence. Recently, in looking to determine the accuracy of studies touted lately in the media that claimed “the more guns a nation has, the more gun homicides they have” I came across this article from The Guardian in 2012. It includes a comprehensive list of every country on earth, showing the rate of gun ownership, and the rate of gun homicides. Not every country provides complete statistics, but most do. The link also allows you to download the data set in the form of a Microsoft Excel spreadsheet file. The data is a few years old, and it shows the US as having an ownership rate of 88 firearms per 100 residents, which is very low, as I believe I’ve adequately demonstrated above. That number is certainly over 100 firearms per 100 residents today. 2) For the bottom of this chart, I grabbed random countries with the lowest gun-homicide rates I could find and compared them to the USA, and to each other. There are some things that are interesting on that chart that definitely disprove the idea that “the more guns a country has, the more gun homicides they have,” such as the fact that France, Norway and Iceland all have a lower gun-homicide rate than England does despite having five times the rate of gun ownership. Also, Japan is interesting, as they have a gun-ownership rate of nearly zero, but still have more homicides by firearm than Iceland (although Japan’s number is still incredibly low). These anti-gun statisticians like to qualify countries by economic levels, such as comparing the USA to other “rich countries,” or to other “developed countries,” but, for example, Brazil is the eighth largest economy in the world. It would have to fit both definitions, yet how often is Brazil cited in any of these statistics? Never. And the reason why is obvious when you look at their numbers. They have 1/11th of the rate of gun ownership (and that’s against the 88-per-100 number that we know is low today for the USA), yet more than 6 times the rate of gun homicides! And look at the homicide rate in Honduras, largely because of drug cartels serving the American illicit drug market. Wouldn’t you want to leave there and come here, legally or not, if that’s where you lived? I would. All of the countries (with the exception of heavy-handed dictatorships like China) with a lower rate of gun homicides than ours do a much better job for their people in terms of socioeconomics. Conversely, all of the countries that have a higher rate of gun homicides do worse than we do in socioeconomics. Some "experts" like to point out that it's the young people who are predominantly the killers in our society. 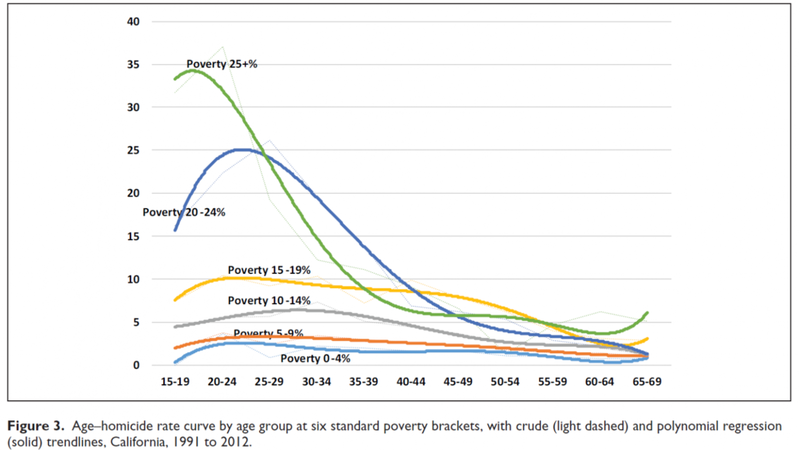 As you can see in this graph specific to our home state, it's not their age that's the problem, it's their poverty. Socioeconomics. When I’m talking about socioeconomics, I’m talking about: mass-incarceration (we jail more people than any country on the planet by both outright number and percentage of population), the Drug War, availability and affordability of healthcare (including mental health), the gap from rich to poor along with the wage gap and the minimum wage, poverty rates, and things of this nature. That’s the overall cause of gun homicides. It’s the overall cause of all violent crime in general. Since many of these are things that the Democratic Party has repeatedly stated they want to fix over the years, why are they so focused on guns instead? 1) Their donors don’t want to address socioeconomics, because it will cost them money. 2) They are using guns as an emotional wedge issue to drive their people to the polls and vote for them. In short, they focus on guns, rather than addressing socioeconomics, because of money and power. Period. Guns are not the problem in our country; our society is.